What does OE mean on a Samsung washer? There are many different reasons why the OE error code can display on your washer. Samsung washer getting the OE error code – The OE error code on the Samsung washing machine display is an indication of an OVERFILL issue. The different Samsung washing machine error codes that may appear are OE, OF, E3, or OC. All 4 of these error codes indicate an OVERFLOW problem. The 3 issues that may cause the fault code “OE” is a faulty water inlet valve, too much soap or detergent added, or a faulty water level sensor which causes the OVERFILL ERROR. All these issues can cause your Samsung washer to display the error code OE. With all these different reasons, checking all 3 will ensure the error is fixed on your Samsung washing machine. IMPORTANT NOTE: If the washer IS OVERFILLED and you get the OE error code then check the Water Inlet Valve(s). If the washer IS NOT OVERFILLED and you get the OE error code then the water level sensor most likely needs to be removed and replaced. 1 – The Water Inlet Valve may have a intermittent stuck solenoid or may be damaged causing OVERFILL. 2 – Adding too much HE detergent or washer soap may cause the water level sensor to believe there is an OVERFILL. 3 – The Water Level Sensor may be blocked, have an electrical issue, or be broken. Step-by-step instructions for replacing the water inlet valve on Samsung washing machines. The most common reason for replacing the water inlet valve is if the washer is noisy when the washer is filling or when the OE error code is displayed. An excess of washing powders or detergent liquids may have been added by mistake. Turn off power to the washer and wait at least 1 to 2 minutes. Turn the power back on to the washer. The drain pump should turn ON and fully drain the washing machine and the excess suds or soap. Step-by-step instructions for replacing the pressure switch on Samsung washing machines. The reason for replacing the pressure switch is when the washer is overflowing and testing the pressure switch proves it is faulty. 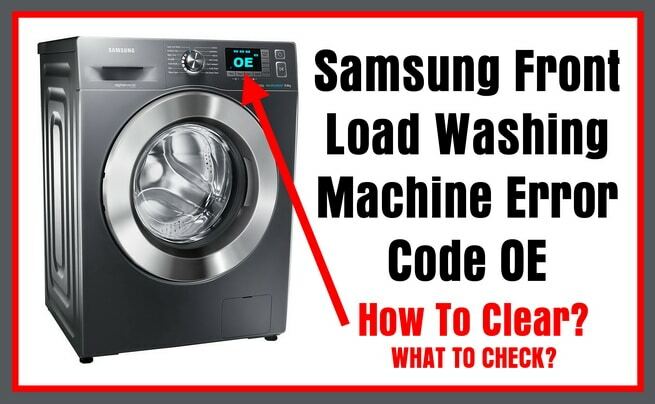 Do you have questions concerning your Samsung front load washer that is getting the OE error code? Please leave a comment below and we will be happy to assist you. I have a Samsung vrt front load I am not getting any error codes on my machine but the moment the power is turned on the drain pump comes on and tries to drain. If I put it on a wash cycle the water keeps running and is drained out immediately. I have cleaned out the filter but that does not change anything. Any ideas?